When Should I Use Short-Term Health Insurance? Short-term health insurance covers basic health care costs for short periods are intended to be a stop-gap measure between two long-term health insurance plans. In many cases, these plans are significantly cheaper than other health insurance plans, and you can enroll at any time during the year, not just during open enrollment. Many short-term health insurance plans last 12 months maximum. These plans cover major medical costs and do not include well visits or annual check-ups. Most short-term health insurance policies will exclude specific conditions. For example, you may not qualify if you are pregnant or if your spouse is pregnant. When Should I Use Short Term Health Insurance? Short-term health insurance may be the perfect solution if you have a gap between health insurance policies, such as when you are changing jobs. You may be wondering what to do if you do not want to spring for more expensive options like COBRA coverage or those plans available through the Affordable Care Act. It's not a good idea financially to risk it and go without insurance because if you have a major medical emergency, you could find yourself hundreds of thousands of dollars into debt. That's where short-term health insurance comes in. Short-term health insurance can provide a low cost, short-term option to help you fill in the gaps you have health insurance coverage and can help you avoid having to pay for medical bills with no health insurance. How Much Will Short Term Health Insurance Cost? Short-term health insurance can be very inexpensive, with monthly rates as low as $25 a month. However, keep in mind that all the plans all operate with a high deductible that must be met before insurance begins to pay medical costs. Some plans provide full coverage once you have met the deductible other have additional coinsurance. If you are pregnant, most short-term health insurance will not cover you, and if your spouse is pregnant they may not cover you on an individual policy as well. 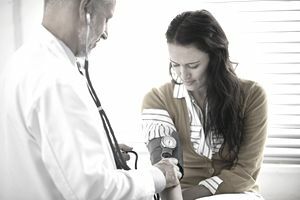 Generally, short-term health insurance does not cover well medical visits or other routine care that would fall under an annual doctor's visit. If you are pregnant, you will have to explore other options. You may qualify for health insurance under the health exchanges set up by your state for the Affordable Care Act. Short-term health insurance policies have a time limit on how long they will provide coverage. Under the Obama administration, you could only be covered for up to 90 days. However, these rules were recently relaxed and now you can secure short-term health insurance for up to a year. Again, these policies are designed to protect you and your assets during the short lapses that you may have in your regular insurance coverage. An insurance agent can explain the differences in coverage and what you will be responsible for. Short-term health insurance does not meet the insurance requirements for the Affordable Care Act. This means that you may be penalized for the months that you use a short-term health insurance policy. However, that penalty will be eliminated in 2019. However, it can still protect you financially if you do have a major medical emergency. Be sure you consider all of your healthcare options, such as policies through the ACA or staying on your parents' health insurance, before signing on the dotted line. When Should I Get Short Term Health Insurance? You may consider using a short-term health insurance policy if you don't have a preexisting condition, aren't pregnant, and are simply waiting for a long-term health insurance policy to kick in. If you are a recent college graduate, many alumni organizations can provide you with a contact and possible discounts on a short-term health insurance policy when you first graduate. This will cover you while you look for a job and wait until your health insurance policy begins at your new employer. Additionally, if you no longer qualify for insurance on your parents' health insurance plan, you may choose to enroll in a short-term plan while you look for a better one or wait for open enrollment options. Since short-term health insurance policies are so inexpensive, it may be worth the little bit of money to have peace of mind and be covered in the off chance you have a true medical emergency or health issue.